The adoption of the Personal Data Protection Act transformed the legal regime for data protection in Singapore. 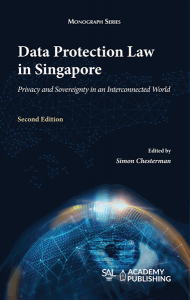 This book explains the history and evolution of data protection in Singapore, highlights issues that are being worked out in practice, and derives lessons that Singapore can learn from other jurisdictions – and that other jurisdictions can learn from Singapore. Bringing together leading scholars and practitioners in the field, the book will be of interest to the academic, legal and business communities. Key questions include how to reconcile notions of privacy in an information age, and how national laws can regulate an increasingly interconnected world. The second edition includes new chapters examining how the legislation has kept pace with technological change and how individual rights have been balanced against business interests in the course of enforcing the law. It also has specialist chapters on image rights and data protection, as well as new chapters on accountability and cross-border transfers and enforcement. Read the introduction online here. Buy the book from the Singapore Academy of Law here.